Tales of Spring Rain (Harusame monogatari 春雨物語), are central to the canon of Japanese literature. Born to an Osaka prostitute and an unknown father, he was adopted in his fourth year by a wealthy merchant who reared him in comfort and provided him with a good education. 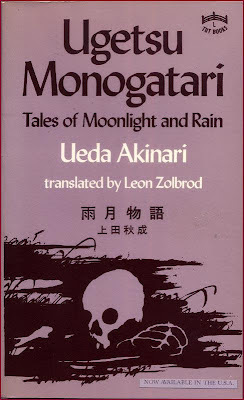 Ugetsu Monogatari (Tales of Moonlight and Rain) by Ueda Akinari (1734-1809) was first published in 1776. Comprised of nine independent stories adapted from Chinese ghost stories, Ugetsu Monogatari is noted for its highly allusive and lyrical prose and is considered to be among the most important works of fiction of the eighteenth century, the middle of the Edo period (1603-1868). Edo literary achievements are normally associated with the fiction of Ihara Saikaku (1642-1693) and drama of Chikamatsu Monzaemon (1653-1724) in the Genroku period (1688-1704) and the popular literature of Takizawa Bakin (1767-1848) in the later Bunka Bunsei period (1793-1841). Ugetsu Monogatari, then, occupies an important yet often overlooked position between these two moments in Edo literary history. The scene: It’s night; someone is alone in a dimly lit room. There’s an eerie stillness, a creeping anxiety. Then, behind them, you notice a strange shape: a hunched-over figure, lurking in a corner. It is standing deathly still. The head is obscured by what looks like tendrils of jet-black hair. A chill runs down your spine as you suddenly realize the person isn’t alone. There’s something in the room with them, something that shouldn’t be there, something anomalous, incongruous … menacing. Scenes like this have come to define Japanese horror or “J-horror.” The genre’s ability to evoke the supernatural has made it into a worldwide cultural phenomenon, popularized by the films of Takashi Miike and Hideo Nakata, and also by anime, manga and video games. However, while a great deal of attention has been given to modern J-horror, relatively little has been said about its precursors, especially the literary influences that so deeply inform its aesthetic. One such influence is the book “Ugetsu Monogatari,” published in 1776 and authored by Ueda Akinari (1734-1809). Conventionally translated as “Tales of Moonlight and Rain,” this collection contains nine tales that all have the hallmarks of classic kaidan (“strange tales”). Ueda’s collection is unique because it sets the standard for the Japanese horror story, with its emphasis on atmosphere, mood and a sense of the weird and grotesque. Stories such as “Asaji ga Yado” (“The Reed-Choked House”), “Jasei no In” (“A Serpent’s Lust”) and “Aozukin” (“The Blue Hood”) read like modern horror, containing vengeful spirits, demonic possession, vampirism and the living dead. In each tale, we see fragile and unsuspecting human characters encountering entities that can only be described as unhuman: ghosts, revenants, demons, goblins, shape-shifters, cannibals and lesser-known beasts of folklore and myth. 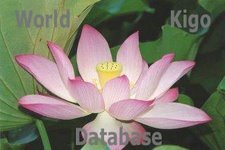 These entities appear against the ongoing human drama of war, desire, madness, disease and faith. Throughout the nine tales, “Ugetsu” returns again and again to a central theme: human beings confronting not only their own mortality but the larger nonhuman world around them. In scenes like these, Ueda describes the creepy allure that one feels just before encountering the supernatural. Instead of focusing on the ghosts or demons themselves, he emphasizes the pervasive mood that surrounds their strange and unnerving presence. It is in this hallucinatory space that sudden reversals take place: the lover you are embracing turns out to be a decaying corpse; a warmly lit home is revealed to be a dilapidated ruin; and what seems to be a humdrum world of human concerns turns out to be the mere play-thing of malefic deities. In “Ugetsu,” the supernatural is always atmospheric, something palpably felt yet difficult to define. However, it would be a mistake to simply label Ueda’s stories as “supernatural.” In the Western context, the supernatural tale often presumes a strict boundary between reality and unreality, a boundary that can be transgressed, but only in rare circumstances. By contrast, the stories in “Ugetsu” move effortlessly between the natural and supernatural, giving the sense of a porous membrane between reality and fantasy, or between the normal and the anomalous; the supernatural pervades landscapes, homes, human lives — and even bodies. 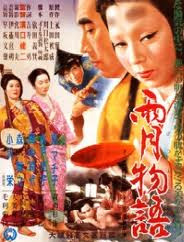 Perhaps this is why “Ugetsu” has been such an influence on J-horror. Though the genre today is filled with all the debris of 21st-century culture — photos, videos, computers, phones and crowded cities — it still depicts human beings embedded in a strange world. It’s one that not only surrounds us but, in many ways, engulfs us, too. He also wrote under the pseudonyms Wayaku Tarō, Senshi Kijin, and Ueda Muchō. Akinari eventually attended the Kaitokudō School in Osaka, where literary historians believe he studied the Japanese classics and began writing haiku. He also turned to writing and publishing collections of poetry in both the waka and haiku forms, but these never approached the success he had achieved with Tales of Moonlight and Rain. This suggests the come and go of cherry blossoms in our physical nature--the world-- and in our mind and dreams--the language. I've put emphasis on the word "saru" 去る; one of its connotations is that one (thing) is gone but is to return, like four seasons or spring and cherry blossoms in this case.
. Edo no takenoko 江戸の筍 bamboo shoots in Edo . ***** . yookai, yōkai 妖怪 Yokai monsters . ***** . Authors and writers of the Edo period .